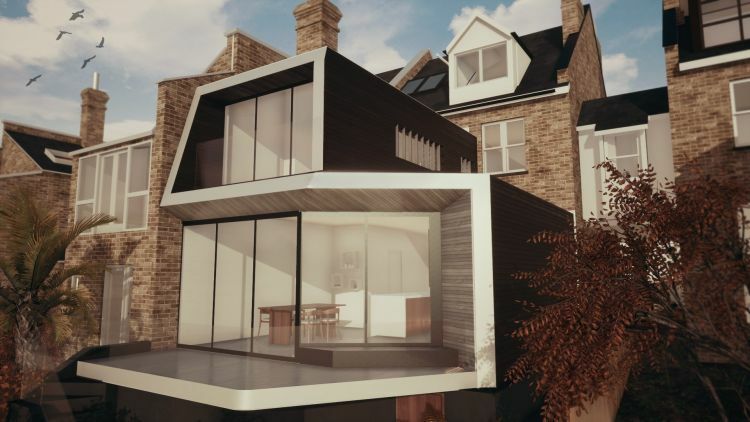 Our client approached us having bought this turn-of-the-century house in North London. To the rear, the property is fortunate to have a large garden which leads directly into Queen’s Wood via a small gate. The garden also contains a number of mature palm trees, a feature that helped attract the client to the property, these are carefully integrated into the design. The steeply sloping site creates huge level differences between the front and rear of the house. 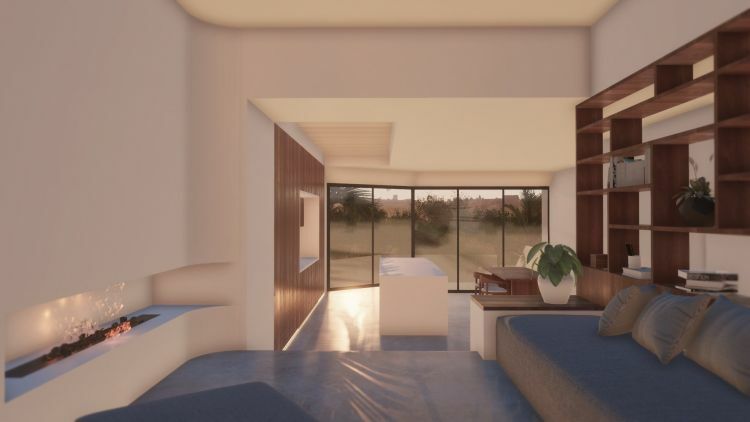 In order to mitigate this and create an interconnected, flowing space the existing rear portion of the house is replaced with a single coherent structure with gently stepping floors. 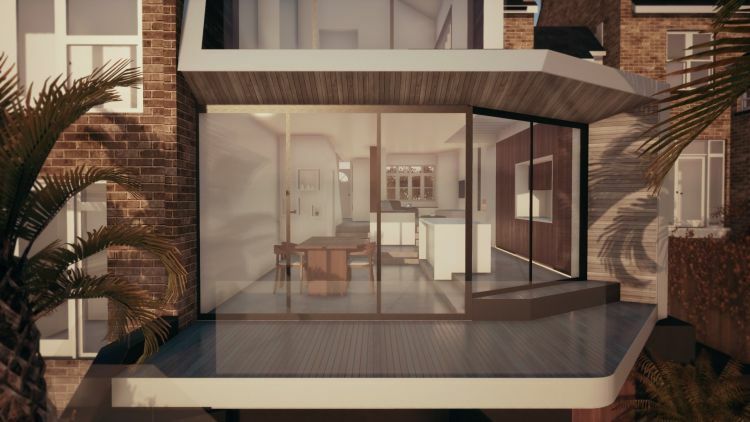 This new volume contains a large, open kitchen and dining space opening onto a deck and topped by an “Atelier” that overlooks the garden and woods to the rear where the clients are able to paint. The proposed volumes are united by a single timber surface that continuously snakes its way from the lower deck up to the roof of the Atelier. The surface variously acts as deck, wall, shading device and roof. The inside and outside of this surface are treated differently. The inner areas, where there is likely to be a large amount of human contact, are clad with weathered silver timber, the outer covered by charred black timber. The south-facing extension calls for exclusion and control of light via the careful use of louvres and overhangs. 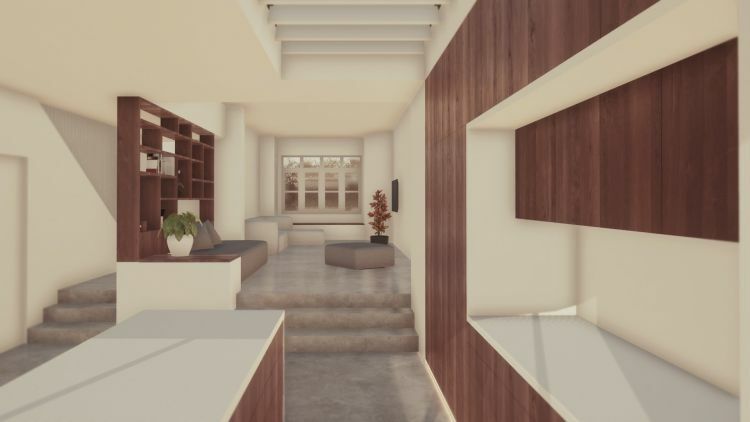 The sloping site and accompanying alteration to the existing levels allows the scheme to easily incorporate a basement area containing a home cinema that opens out onto a secondary lower deck connected to the garden.